Philippa Kingsley shares her very personal memories of the passing of her beloved father Sidney and her dogs Voguie and Cosmo, as well as her mother’s descent into Alzheimers. 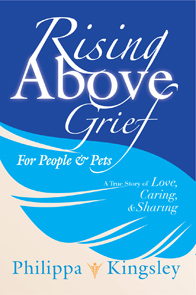 Through reading about Philippa’s experiences, the reader shares in the journey of love, loss, and healing, and comes to understand that Love is truly All, and that it transcends death. Her father and her dogs continue to assist her from spirit.